These first two photos were taken at the end of our trip. On our drive back through Arkansas, we stopped to visit my second cousin Ray Don Bostian and his wife. He is the one who collected all the old family history. They live in Hope, the birthplace of President Clinton. 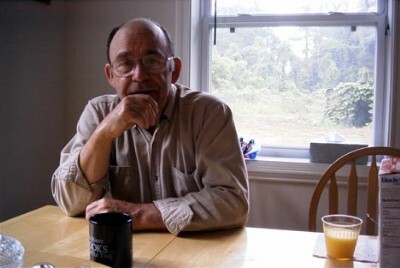 While we were sitting at the kitchen table, Ray gave me his digital camera to look at. As I checked the optical and then the digital viewfinder, I snapped the shutter just to see how it worked and I got this great informal portrait of Ray. Apparently the light from the window kept the flash from working. The only change I made to the image he e-mailed was to reduce the size slightly and save it at 90% quality. Ray then took this photo of me. The flash was necessary because this part of the room was darker. This is the most recent photo of me. Ray and Martha have a new house in the middle of 160 acres of woods most of which belongs to her father. He still lives in an old house near them. 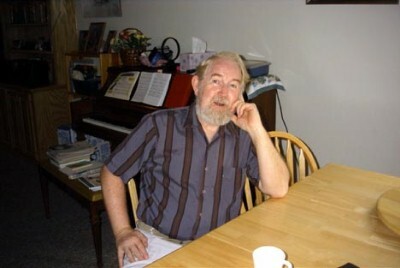 Ray and I were only vaguely aware of each other (he knew my sister) until I started trying to verify some of the information he had given my uncle many years (20) ago. I located him on the web a couple of years ago and we are more friends than relatives now. We usually plan our visits back home for May. The weather is usually good and May is the time for 'Decoration Day' observances back home and in much of the south. Decoration Day preceded Memorial Day and dates back to the Civil War. It was a time to clean and beautify the grave sites in honor of those who had died fighting for what they felt was right for their country. 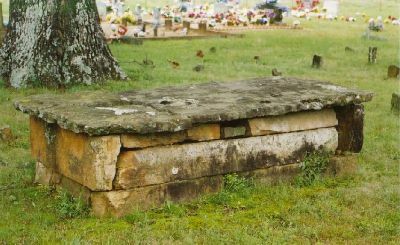 My step father's family members have been buried in the Old Liberty Cemetery in the north end of Conway County in Arkansas for the past hundred years or more. And that is where my mother was buried this April. There are so many cemeteries that the Decoration Day observances are scheduled thoughout May and the Old Liberty Decoration Day is always on Mother's Day. This was not a year to stay home and observe Mother's Day here with our children. This is a location on State Highway 95 about one mile south of Cleveland. Just over this little hill is a deep valley and then there is another hill to climb up to Cleveland. 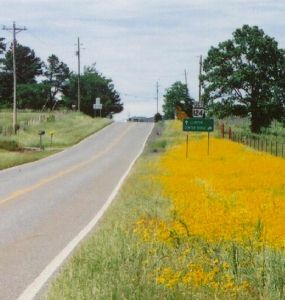 Colorful wildflowers like these were all along the highways. This is a view of West Point Remove Creek at a location about eight miles northeast of Cleveland and just a couple of miles northeast of Old Liberty Cemetery. The Halbrooks lived in this area during the late 1800s, having moved there from the valley of East Point Remove Creek on the east side of Wolverton Mountain. 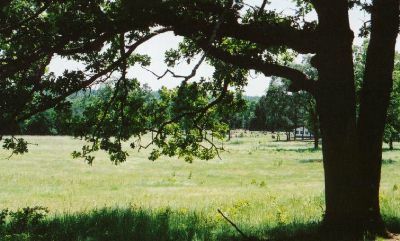 This is a view of Old Liberty Cemetery from the northeast. We usually approach the cemetery from the west. The road to the northeast has been greatly improved in recent years. The tombstone at my mother's grave is just barely visible east of the building. It is the small black spot. This is a view of Old Liberty Cemetery from the west side of the building looking southeast. Decoration Day is something like a community reunion. Family and friends gather for a time of meditation in the cemetery and then assemble for a religious service in the building. A 'Dinner on the Grounds' is shared under the shade of these trees at noon following the program. There usually is an afternoon program of singing. The night before we started to Arkansas, we found out that the husband of my step-dad's little sister had died. We drove to Springdale in northwest Arkansas to take Ann's mother home; then rushed to Conway County in central Arkansas to be at the funeral. After the funeral, we all went to the cemetery for the graveside service and afterwards we gathered at Momma's grave to see how the recently installed stone looked and to place the flowers. Ann took these photos for me. I am at the left, next to me is my little sister, Sherrye Lee, and by her is the youngest one in our family. He is 11 months younger than Sherrye. 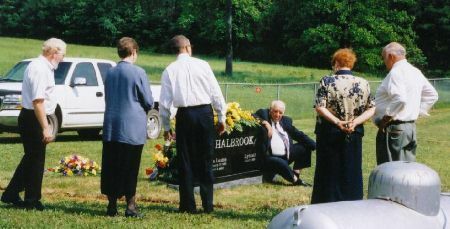 Dad is sitting on the edge of the tombstone, my sister, Jeanne, is next and then her husband, Raymond. 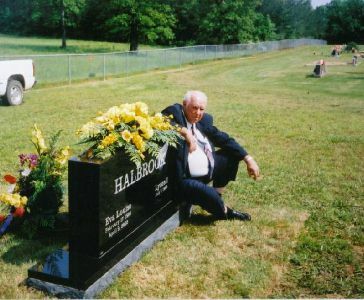 Dad choose a grave site near the building rather than a place down in the cemetery with the rest of his family. Eventually there will be others near this location. The girls want to plant some shrubs around the fuel tank to make it look a little better. I saved these images at lower than usual resolution to save memory space and to speed uploading, so they aren't as sharp as others on this web site. This tomb of natural stone is not at Old Liberty, but at Lost Corner Cemetery. There once were several like this at Old Liberty, but the descendents of the ones buried in them removed the stones some years ago. The stones are for decoration only and do not serve a practical function in protecting the grave. When we were children, we would try to peek inside these tombs. I remember that I once saw that the grave had caved in inside the stone enclosure. to find ways to "Contact" me. On Mother's Day, we all returned to the cemetery for the Decoration Day program. The program usually has a welcome, group singing, special music, a sermon, and prayer, of course. A short business meeting might be held before lunch, but usually follows lunch. This is one of the groups that played and sang. 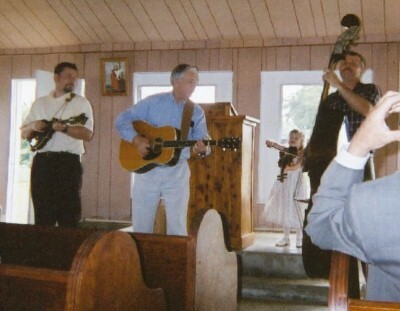 The man with the guitar is the husband of the step cousin that was my age. She and I were close friends when we were children and are still close. Their two sons are playing the banjo and bass. Their only grandchild is playing along on the violin. This and the next photo were taken with a disposable camera left over from John's wedding. The images are a little soft. We moved outside and the communal meal was laid out on tables and everyone shared this 'Dinner-on-the-Grounds.' Those in the foreground are my sister on the left; her daughter-in-law holding the little girl; her son; and one of our nephews and his girlfriend. The little girl is my sisters granddaughter. In the background at the end of the table are my stepdad's youngest sister in light blue, whose husband had just died; my youngest sister, Sherrye, who is the mother of the nephew in black; the widow's daughter (her head is just visible); and two granddaughters (the girls in white and blue). 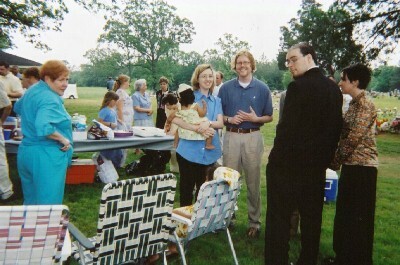 Photos of my cousin and me, the countryside near Cleveland and the cemetery, the family at the cemetery before, during, and after the Decoration Day observance. The family at the Lanty Cemetery the following Sunday, Ann's Dad at his parents' tombstone, the fine mansion where Ann and I were married, family and friends gathered at the Memorial Day fish fry. Photos from the surprise 60th birthday party my wife and sisters gave for me. They include my children and my mother before her final illness and my high school girlfriend. 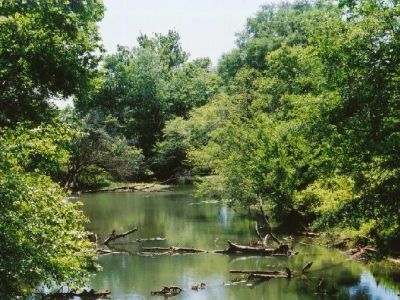 There are also some of Ann's family and my Dad's cousin and his family plus scenes from northwest Arkansas.